Please leave your general feedback regarding the 1.5 Public Test in this topic. Edited by vuque, Yesterday, 02:35 PM. Edited by Jahpero, 12 April 2019 - 04:53 PM. This post has been edited by the moderation team due to off-topic. Btw weren't we promised 700 dmg hesh on types and 900 dmg on HE ? Why they have same dmg AGAIN but 3 times more pen on premium hesh? 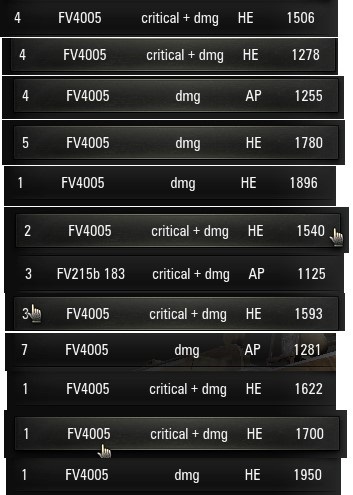 So once again pay to win tank as it used to be just with less dmg ( Or not since 200 pen hesh will still deal pretty much same dmg). These are just bad.Don't do it.Or at least put 1100 as it used to be on standard HE. 1st actually good looking update in a long time that I can remember, not that its gonna be enough to get me back to the game but nice to see the game taking some right direction after a long time. This looks like a solid patch, except for one aspect: The FV4005 nerfs. I can understand the Type 5 and Type 4 adjustments, since those tanks are met with utter disdain ever since their HE guns were added, but the nerf to the FV4005 is unnecessary and frankly too harsh. The FV is a one-trick pony, which excels at one thing only: an ocassional one shot on someone who makes a major mistake in the positioning of their tank. It gets spotted by everything, everywhere and every time. I am quite confident WG will find the community to react to this mistake in the same way as it did to the proposed 6 shot autoloader to the Bat-chat 25t - major disapproval, and I would appreciate them listening to the community the same way as they did in the Bat-chat situation. Edited by _Arcanus, 11 April 2019 - 07:11 PM. WG, I still hope you are going to rework arty missions as well. 1. The ability to exclude 2 maps with WoT Premium account, it should be for all players or for none. Ok... so anyone will explain to my why Type4 and Type5 will have less damage than tier 6? Yes, O-I has 910dmg on HE, E100 has 950, 60TP has 950 with similar RoF. 192mm HESH won't help to balance things out as you cannot penetrate most pancakes (soviet objects) with it anyway so all it will work against are some LT (except soviet ofcourse ), japan med, czech med, swedish med, french med and italian med (sorry, forgot Leopard ) This ammo will NOT work on heavily armored targets AT ALL. Nice "alternative and expensive" ammo... and soviet meds will still have 330-340mm HEATs since tier 8 (object 416). Yup, nice, nice. 290mm penetration on 14cm gun is a joke also. E100 has 334mm HEAT, Object705A has 317mm HEAT, 60TP has 317mm HEAT. Types have 282 (atm) AP. What exactly AP benefits there? Big penetration loss over distance and autobounce over 70ish degrees? Yay! Tiger II, Lowe, T34 and KV-4 have similar penetration on TIER 8! Ridiculous! Edited by Promil1984, 11 April 2019 - 07:42 PM. Still not nerfing this disgusting premium ammo ? Great, now every clicker with premium acc bans 2 of the small corridor maps, probably Ensk and Himmelsdorf. So now we get 3 clickers every single game. Great job WG. Do you have any plans to nerf lower tier SPG's? We all know they are overpowered. Circonflexes and someone else (can't remember the name) made videos saying the exact problems with them. Are you going to ignore it? The FV4005 nerf is too harsh, the tank is already hard to play, I can understand nerfing the dispersion, but traveerse and speed? really? the FV is left with nothing! All that needs nerfing about the FV005 Is the alpha damage that's it, changes to arty are welcome, still think it needs to be only 1 arty per team, would much rather have 1 arty in every battle than 3 arty in most battles, changes to prem account are brilliant, black listing maps also brilliant. Oh wow I'm actually looking forward to the FV4005 nerf. This has to be the best update ever. Let all them clueless wannabe unicums start crying how it shouldnt get nerfed. Would be even better if this tank was removed from the game completely. Give the option to go back to the old English TD if you're going to make FV4005 garbage again. I want Stalinium armor on all my tanks. Edited by FunkyTowel, 11 April 2019 - 08:07 PM. M44 nerf when? 3 years from now? Edited by az_zill, 11 April 2019 - 08:35 PM. You really think this is a feedback post? Name one time, something was said here and WG listened. When they want to do sth, they do it. They don't care about our feedback. Remember WVs. 90% of the posts were "don't add them".